“Karaoke” is an entertainment became popular in Japan in 1970’s. You can sing songs with background music. It is very popular because you can sing your favorite songs as if you were on the stage. Nowadays you find increasingly more “Karaoke” shops where even English songs are available for foreign visitors. Let’s Go to “Karaoke” in Japan! 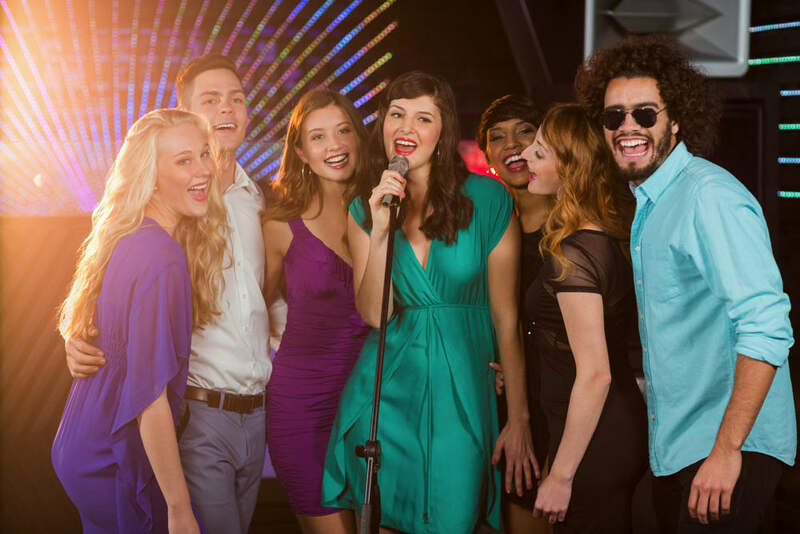 ”Karaoke” is an entertainment that you can easily sing songs from the hit-chart like real professional singers. With background music, you can sing songs with a microphone following the lyrics on the monitor screen. There are two kinds of “Karaoke”. One is “Karaoke Bar” where you share the music and singing with other guests while drinking. The other one is called “Karaoke Box” where you have fun with your friends in a separate room. Both places are popular because you can feel like real stars while singing. .
”Fiesta” has a line-up of more than 26,000 western songs inclusive of pops, rock, soul, oldies, etc. Singing on the stage makes you excited and feel as if you were on the live show. Mirror balls and illuminations by spinner exalt the mood. The 50” monitor on both sides project your singing on the screen. You can bring in foods you want and you order various drinks such as beer, cocktails and soft drinks. ”English Karaoke Bar Bruce” specializes only western music with a line-up of 37 000 songs. For popular songs you can choose out of several versions such as CDs taped in studio with real band, on line “Karaoke” with lyrics, DVDs showing the original singer of the songs. This is because the owner of the “Karaoke” is very particular about quality of sound. The speakers placed on four corners in the hall provide good sound effects and you feel good in singing while listening to your own singing as well. 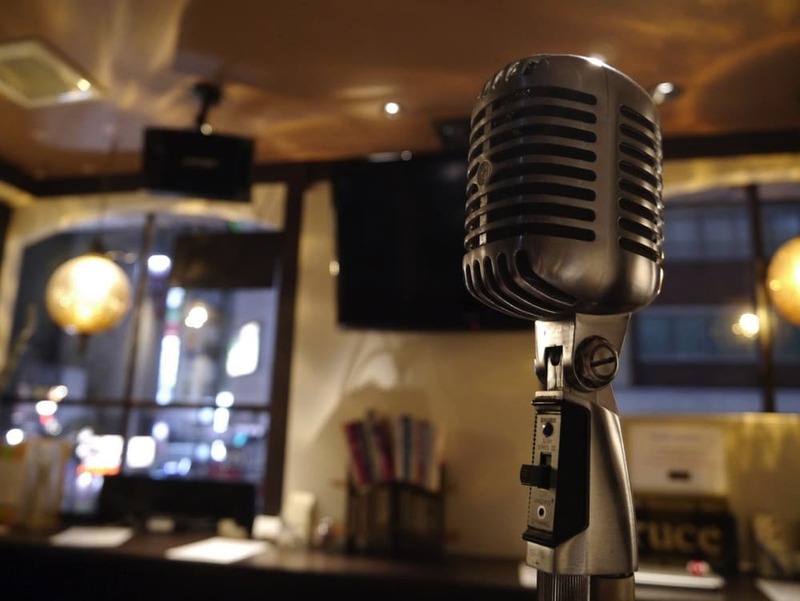 Since this “karaoke” is only for western music, foreigners can easily experience “Karaoke”. ”Hong Kong Club Q International Party Bar” is a “Karaoke” and disco bar run by an attractive hostess from Hong Kong in downtown “Minami”, Osaka. It is open through the night from 20:00 to 05:30 and you can enjoy “Karaoke” and dancing. Customers with various nationalities come here and even if you come alone, male or female you can have fun. There are 7 seats at bar as well as 15 box seats accompanied with live shows and music. Every Thursday you can watch pole dances by Japanese girls. Though admission is free, you have to order “Utai-hodai” (all-you-can-sing) menu to enjoy “Karaoke”. The Drunken Clam is a popular spot for foreign tourists in Osaka. Since there are many foreigners, it has an international ambience to interact with both foreigners and Japanese. Not only “Karaoke” is all-you-can-sing, but customers also enjoy joyful atmosphere and conversations in English. It is called English “Karaoke-bar” for “Karaoke” and drink, and also for opportunities for exciting encounters. ”Joy Sound” and “Big Echo” are major “Karaoke” chains in Japan. As the number of foreign tourist has increased and “Karaoke” is getting more and more popular, they provide multi linguistic service. 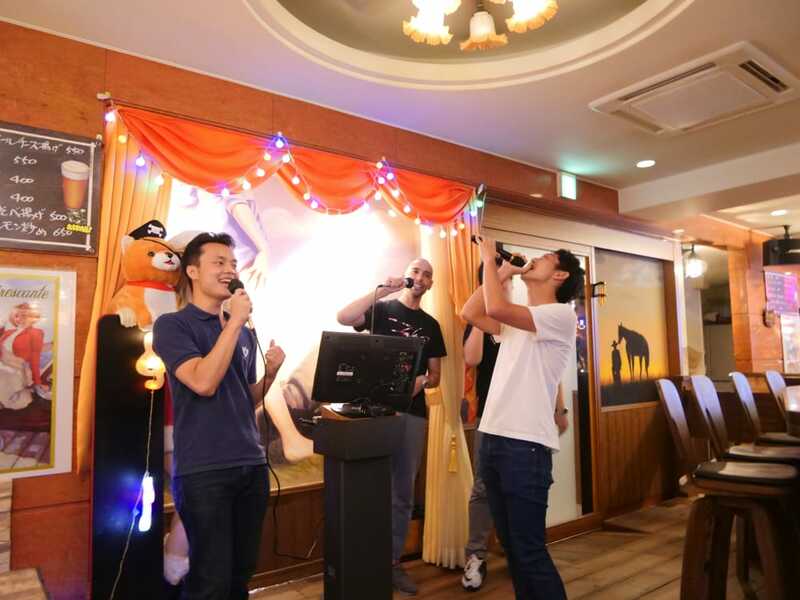 Now that more languages such as English, Chinese and Korean are available for “Karaoke” song and even at the reception as well, more foreign guests visit “Karaoke”. Translations in 30 languages are available by smart-phone. Since it is complicated to use “Karaoke”, they provide simple plan for beginners and explanations in alphabet. If you are too shy to sing in public, private “Karaoke” boxes are for you. You can try “Karaoke” party with a tour guide in English. It is a good experience of “Karaoke” on the big stage with background music from latest equipment. 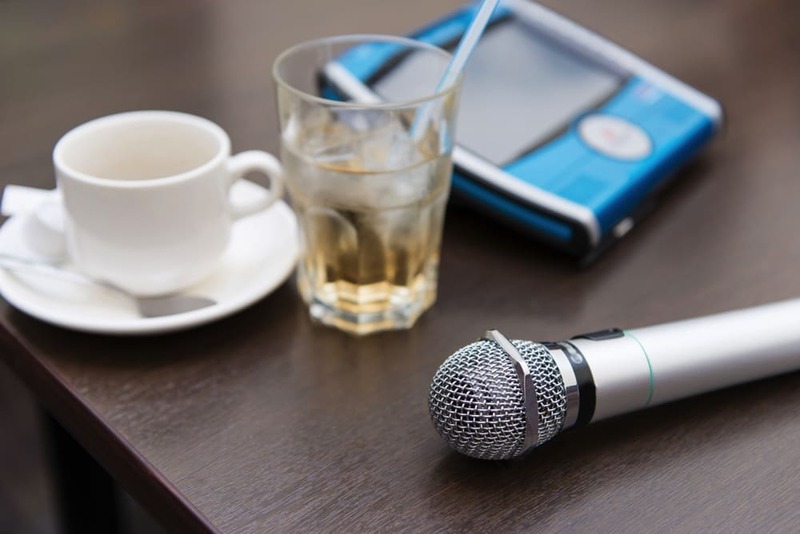 The tour fee about $81 USD includes “Karaoke”, guide and one drink.